Tommy Sheridan, the controversial figure at the heart of Socialist politics in Scotland is returning to Fife after a spat with Leader of the Lib Dems in Scotland Willie Rennie MSP at a public meeting earlier in the month. 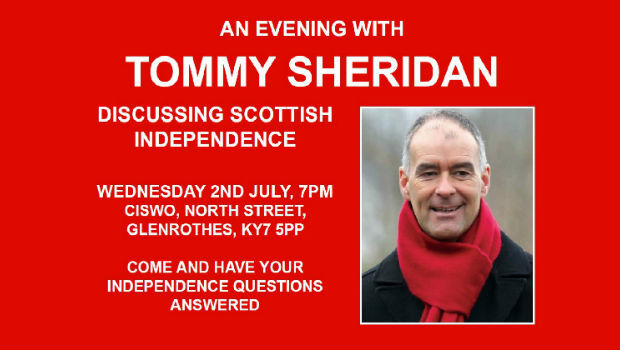 The latest public meeting on Mr Sheridan’s epic “Hope over fear” tour will take place on Wednesday at 7pm in the CISWO in Glenrothes. The previous meeting at Abbeyview Community Centre on 24 June had a rancorous note to it with a very vocal audience and some antagonistic behaviour from some of the participants, with Mr Rennie appearing to stride across the stage with his microphone at one point to confront Mr Sheridan at closer quarters. The respective speakers at the debate were Willie Rennie MSP from the Liberal Democrats and Cllr Dave Dempsey from the Conservatives for No, Tommy Sheridan and Fiona MacDonald from the PCS Union but appearing in a personal capacity for Yes. We have included a clip from the debate below so that readers can make up their own minds on the conduct of all those involved.